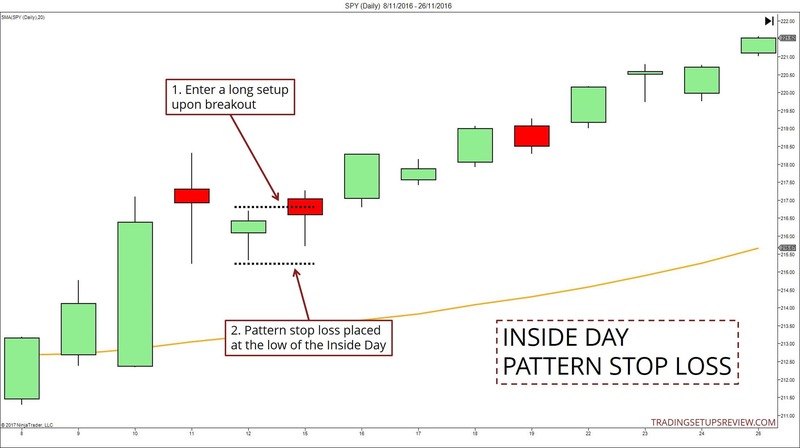 The Inside Day is an important pattern for price action traders. Even if you do not intend to trade it, you need to understand its significance. Inside Days represent critical points that uncover useful clues about the market. What is an Inside Day? An Inside Day is a two-bar pattern. To identify an Inside Day, you need to compare the current day with the day before. The day high must be lower than the previous day high. The day low must be higher than the previous day low. Simply put, for a day to be an Inside Day, its price range must be completely within the range of the preceding day. Inside Bar is any price bar that lies within the range of the price bar before it. 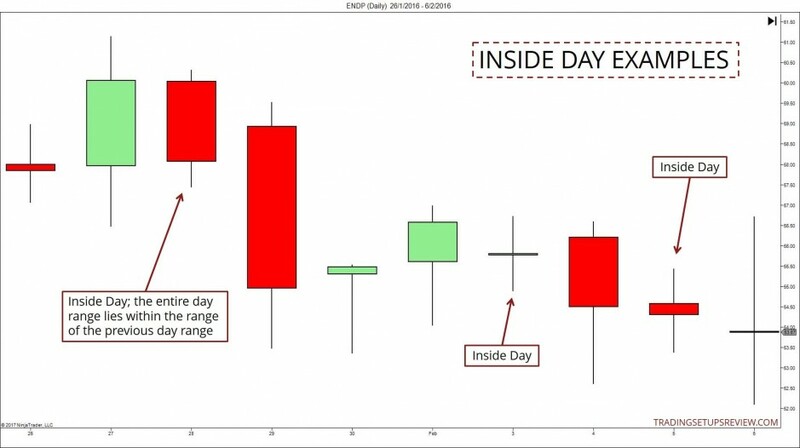 Inside Day is an Inside Bar on the daily chart. A Harami is formed when the candle body lies within the body of the previous candlestick. Its premise is similar to the Inside Day, but they are different patterns. Click here to learn more about the Harami pattern. What does an Inside Day mean? An Inside Day shows you what the market is not doing. The market failed to rise above the previous day high. It also could not fall below the previous day low. Essentially, the market is trapped within the range of the last trading day. The market is not moving. 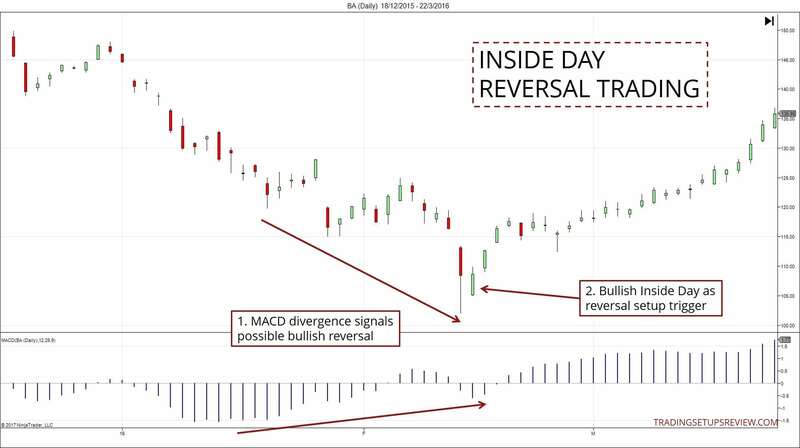 Many traders think of an Inside Day as a trend reversal signal. This approach makes sense when other factors support a reversal. A more sensible way to interpret an Inside Day is to view it as market indecision. It signals lower volatility in the market. Market uncertainty might precede a reversal, but it can also be a pause in the current trend. You can use the relative range of the Inside Day to judge the level of indecision. If the range of the Inside Day is just slightly smaller than the previous day range, it hints at a slight hesitance. But if the Inside Day range is much lower than the previous day range, it implies deep uncertainty. How do you trade an Inside Day? An Inside Day is a short term price pattern. It shows a pause in the market, but tells nothing of its future direction. Hence, you must not construct a trading strategy using only Inside Days. It is crucial to trade an Inside Day as part of the dominant market trend. Always assume that the market will resume its current trend after an Inside Day. Make an exception only if there are substantial evidence of an impending reversal. Be careful of trading Inside Days in a sideways market. In choppy price environment, Inside Days are unreliable and offer inferior reward-to-risk ratio. 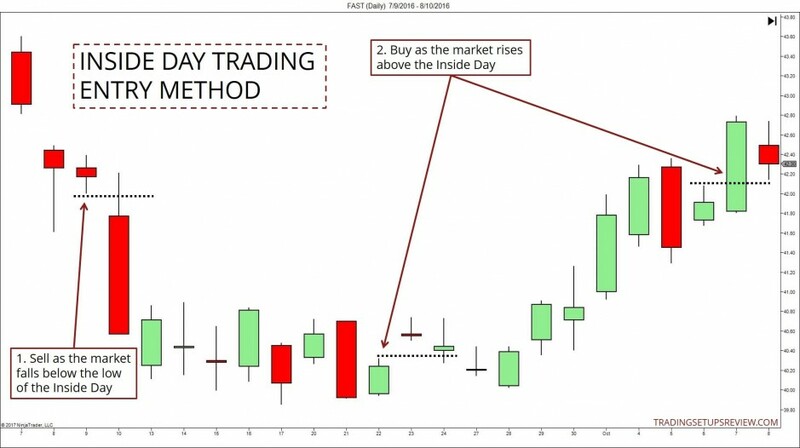 Use price action to trigger an Inside Day setup. Instead of waiting for a breakout of the Inside Day, you may enter the market based on the next day’s opening price. To learn more about this entry strategy, click here for the Three-Bar Inside Bar review. To trade a breakout in either direction, use an OCO order. It allows you to catch a breakout regardless of the breakout direction. Consecutive Inside Days imply that a triangle chart pattern is forming on a lower time frame. In this case, it’s a good idea to drill down to the lower time frame to finetune your entry. One of the advantages of using an Inside Day is the implied pattern stop. When you enter a long setup, use the low of the Inside Day as your stop-loss. When you enter short setup, use the high of the Inside Day as your stop-loss. As an Inside Day usually has a contracted price range, it offers a relatively tight stop-loss. While this works well to limit your trading risk, it exposes you to more whipsaws. Hence, if you are confident of your trend evaluation, consider a re-entry if you are stopped out. Volatility stop losses are also useful for reducing whipsaws. By considering the recent volatility, you can arrive at a logical stop-loss. This approach usually allows the setup more breathing room to wiggle. Learn more about volatility stops here. Consider using a time stop. This approach is useful for scalp-like trades aiming for a conservative target. It will help to ensure an efficient use of trading capital and disciplined trading. An example is to exit the trade in two days regardless of the profit/loss status. In this example, the 50-period simple moving average (SMA) is our trend filter. 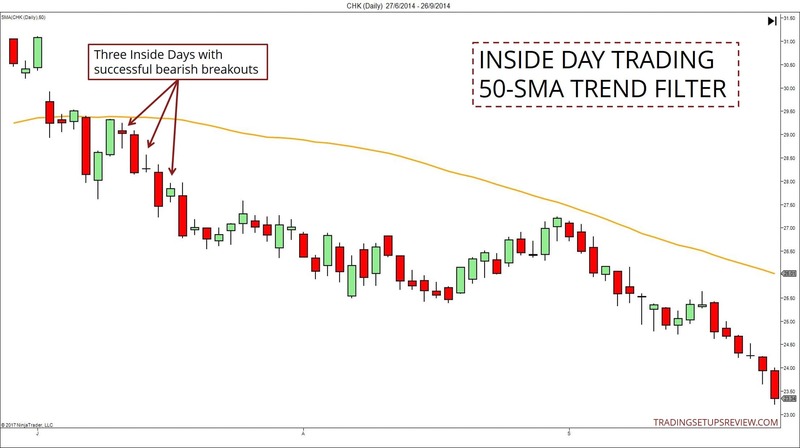 This chart shows three successful bearish breakouts of Inside Days shortly after the market fell below the SMA. You can use this straightforward method with any trend filter. Trend lines work well too. Inside Days should never be used in isolation to trade trend reversals. However, Inside Days can form part of a reversal trading strategy. In this example, the solid MACD divergence pattern set the stage for a reversal trade. The bullish inside bar at the trend extreme served as a low-risk entry for a reversal setup. Exhaustive volume spikes are valuable reversal clues as well. For more Inside Day trading strategies, refer to the following articles. 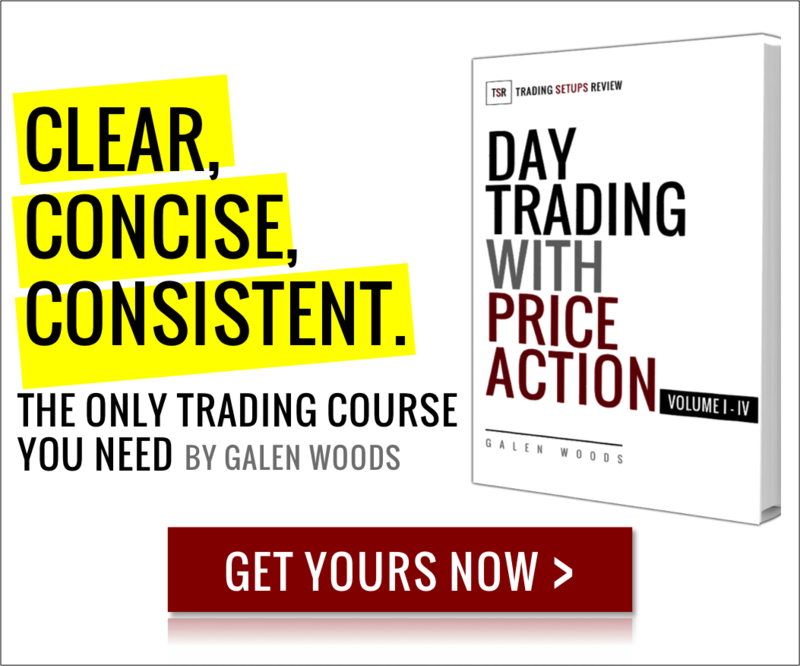 They contain detailed examples of creative ways to trade the Inside Day pattern.